Have you ever gone on a website that you knew had the information you were after, but spent forever finding what you were searching for? Making information easily accessible is imperative to provide a good user experience. That’s why this week’s #WebsiteWednesday is dedicated to searchIQ.xyz – a powerful search tool for WordPress and other sites with advanced analytics to improve your user flow. Originally a WordPress plugin, searchIQ.xyz is a free search platform that fully integrates with your website. searchIQ’s algorithm provides quick and accurate results and allows for multiple customization fields to be set. These fields include the ability to prioritize and re-order search results, as well as the ability to set synonyms for inexact keywords. The killer feature of searchIQ, however, is their cross domain search, which allows users to search for content across multiple websites. 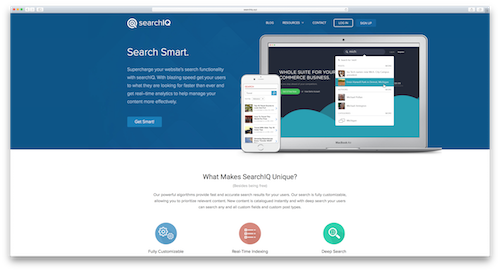 searchIQ started out as the winning product from a hackathon. It currently has over 1000+ downloads in the WordPress store and overwhelmingly positive reviews. In fact, searchIQ has been so well received that their team is now working on a Pro version of the plugin.